Man, beat me to it . Past few weeks been working on integration into our current workflow and I am very impressed so far. I go to start a writeup today and there it was! Its very simple to use, lightweight and powerful. 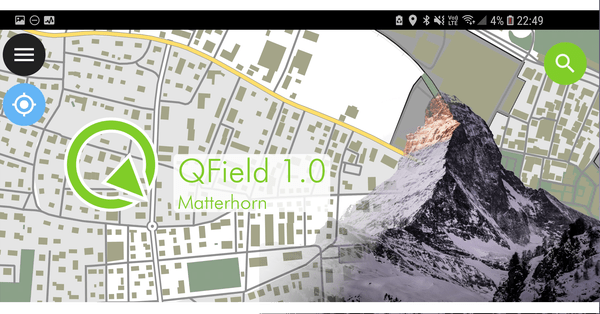 Any QGIS project from your desktop will seamlessly convert over into a nice mobile package for use in the app and works online and offline. "Inside the positioning menu you can turn on the positioning display which will show the current coordinates which are reprojected into the project CRS along with precision information. GPS devices are capable of measuring the altitude next to the current 2D position on the earth surface. This information can be saved"
Or, like me and other drone mappers in the forum, you might want to bring in your own fancy super high-resolution orthomosaic from your last drone flight. Simply tile it up and put on your server and add the address for a new XYZ tile layer (you can tile any image/raster this way). Why is this slick? Because you can digitize and edit your data in the field on your own high resolution imagery and for us we typically fly a site first before starting any fieldwork. I will post some more of my experience as I test and tune. Hopefully others here will try this software and find some utility because I sure am looking forward to incorporating into our workflow. Great, seems to be the app I was looking for. Very interesting! Looking forward to testing this!